And it was glorious.This venue, the Bee Ballroom, was a dreamy place to have a late afternoon wedding.
. . . or bust the family’s budget. Be jealous, you all. I got to be the mother of the bride this summer. 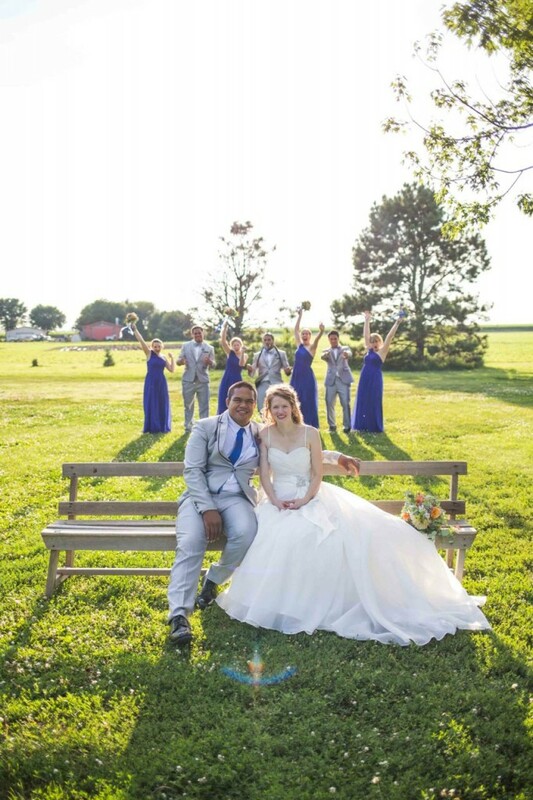 Bethany married her lovely man Saia in July, so I had the privilege of helping Bethie plan and throw a wedding for them. 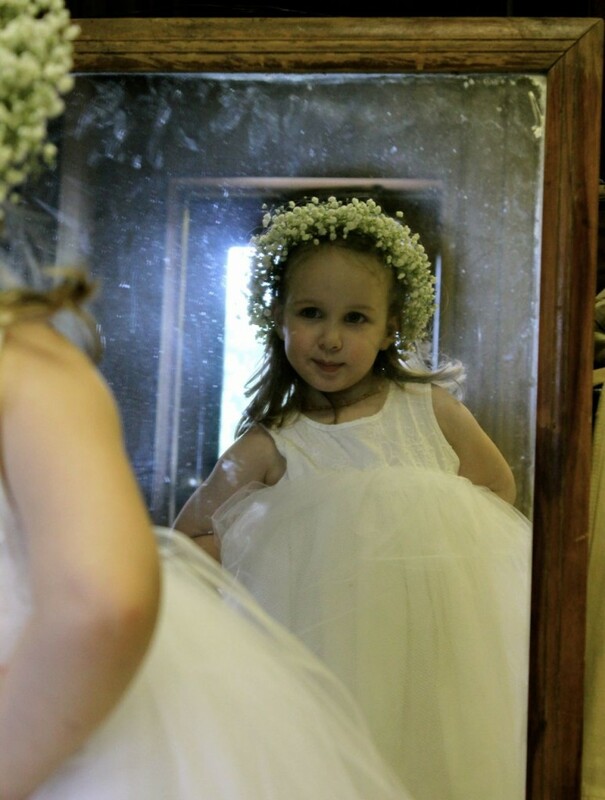 She was not the type of bride who wanted to do it all herself sans parental involvement. And her hubby-to-be was nearly four thousand miles away, working in Hawaii for the summer. She condescended to allow me to help, so I happily sat down with her one evening, we made a plan and we pulled it all together with ease. 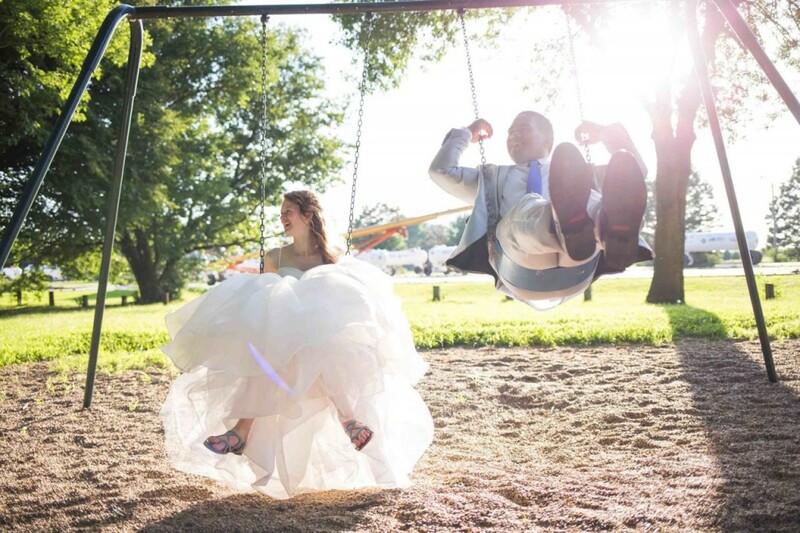 A few weeks later, an absolutely perfect wedding ensued, without the proverbial hitch. Oh wait, no, that was just a dream . . . scratch that . . .
Confession: I thought I would be the type of person who would be fairly good at planning and throwing a wedding. I wouldn’t say this about myself, but my friends say . . . that I have a good eye for color and design, and I certainly know how to throw a party. Plus I produce a melodrama every spring, and weddings–one must own–do have elements of the melodramic in them. Bethie, I think, felt the same way about her own abilities. We were, I think, a bit smug going into the process. 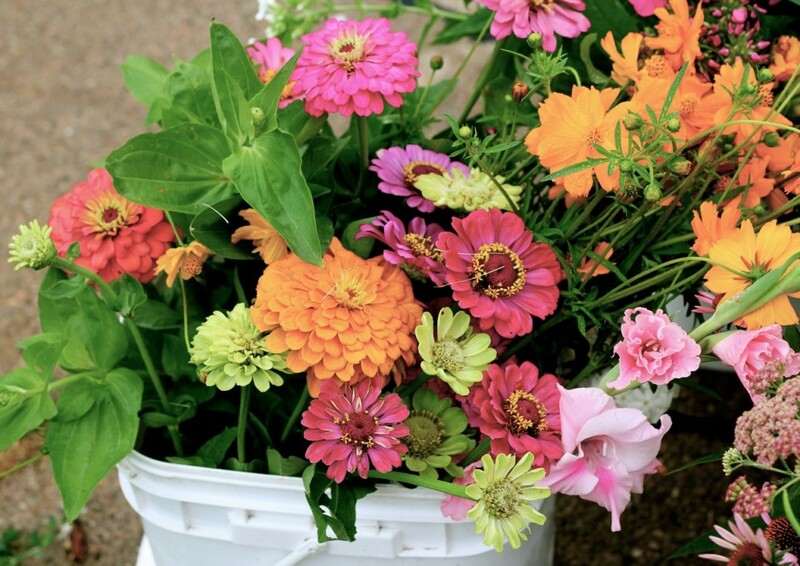 These flowers came out of our own flower beds. That’s why it was such a humiliating shock to discover that we both struggled so much with the whole thing. We were gripped with insecurity, lack of confidence, and bewilderment with the entire process. When I was able to entertain a cogent thought (which wasn’t often) during the few months that we were planning and working on the wedding, I knew that–when the smoke cleared–I needed to write a blog post (if I, indeed, survived the whole ordeal) about all the things I wish that somebody would have shared with me, beforehand. And here we are, nearly five months after the fact. The wedding was gloriously beautiful, and most everything went without a hitch. And the day afterwards, I was sicker than a dog. Tension, stress, and probably the fact that I hardly ate or drank anything for a couple of days before the wedding (I rarely eat when I am stressed) contributed to the Mother of all Migraines the next day. So I make good on my promise, without further preamble, and share with you the 14 things that I wish somebody would have told me before we started to plan Bethie’s wedding. Hopefully this post will be helpful for brides and mothers, both. At the risk of distracting you to the point where you won’t be able to concentrate on these words, I’m going to share some pictures of the wedding, with Bethie’s permission and that of the photographer, too. I get a little weepy every time I look at them. It was, after all, a marvelously beautiful day. So, enjoy. By the way, many photos (as indicated) were taken by Ian Rothell photography. 1. Make time for this. Sit down together with a calendar and a big pot of tea, and deliberately block out times that you will work on wedding tasks. Cut something out of your schedule to make time for this big endeavour, if necessary. There will be countless shopping trips, evenings discussing details, plenty of odd moments surveying what others have done online, and that doesn’t even touch getting ready for the actual event. If you’re already a busy person, which you probably are, time will not magically appear, like the sea parting in front of Moses. Here’s what I learned: if you don’t cut something out of your busybusy schedule, you’ll be busybusy with a wedding to plan on top of it. Something will have to give. Amalia and I didn’t do farmer’s market last summer, and that was what we consciously cut out, but we filled up that time with other things and still we had to carve out time for wedding tasks. We aren’t very good at cutting things out, it seems. Dreams, where weddings are concerned, are possible, but they take time. Furthermore, as much as you can, budget your making-the-wedding-happen time. It would have been most helpful, for example, if we would have set goals for April–for May–for June. Don’t laugh. The chores and responsibilities piled up like dominoes toward the end because we kept putting off the more difficult decisions and tasks. 2. Strike the word “perfect” from your wedding lexicon. This. Very. Minute. How many times have you heard the term “the perfect wedding”? About two hundred million kajillion times? Yeah, me too. This will not be a phrase you will use. Your wedding will not be perfect, no matter how much you toil and how hard you wish for it. It just won’t be. (If it is, please tell me how you did it–I do have another daughter in the wings!) It will more than likely be a lovely, memorable, beautiful day, and it will accomplish its goal, that is to get your daughter and the love of her life married—but it will not be perfect. If you strive for perfection, you will be disappointed, frustrated, and grumpy. Have you heard of the term “unrealistic expectations?” Yep. Strike the word “perfect” from your wedding lexicon. This. Very. Minute. 3. Start in on everything as early as you can. We almost lost the venue we really wanted, by minutes. The same thing happened with the band that we wanted. I called the contact person for the Bee Ballroom, which Bethie had settled on for the ceremony, to ask a few questions. Then I called Bethie to check everything out with her, then I called the ballroom contact person back, and in the interim the ballroom was rented for the weekend we wanted. Bethie didn’t mind pulling the date forward a week, so it all turned out okay, but we could have lost the venue entirely. Venues book very, very early–so do bands, DJs, anything that is rented–so start deciding and calling immediately on these things. 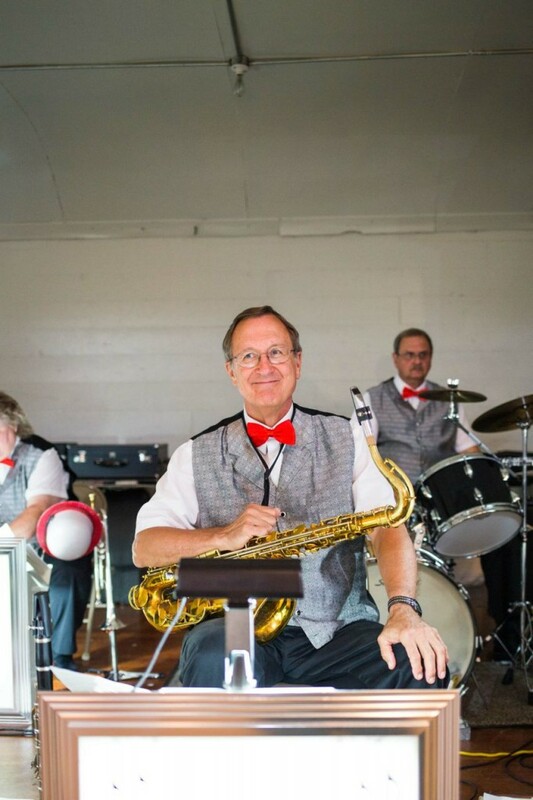 The Leo Lonnie Orchestra played for us: they were fantastic, and lots of fun to work with, too. 4. Decide how much you want to spend first. This sounds so unromantic and calculated, I know, but Romance doesn’t pay the bills. Decide the dollar amount that you can afford to spend, and then stick to it. This will give you peace of mind, when you are shelling out money left and right, hither and yon. If you’ve budgeted for it and you know that you can afford it, and you are spending what you planned to spend, you won’t have to worry about eating 29¢ ramen and rice and beans for the next year. The children still at home with thank you for that. Decide on a budget first. Romance doesn’t pay the bills. 5. Decide what is most important to the bride. Do this with your budget in mind. For example, Bethie didn’t mind buying a wedding dress that was on sale at a fabulous bridal store in a tiny town (it was stunning, and a tiny fraction of the cost of the ones she liked in the city), or making the food ourselves (the cheaper options–no prime rib or lobster bisque, sorry, wedding guests), but she really wanted two relatively expensive things: live music with a dance at her wedding, and photos taken by a professional wedding photographer. So we did a lot of things on the cheap so we could make these two things happen. 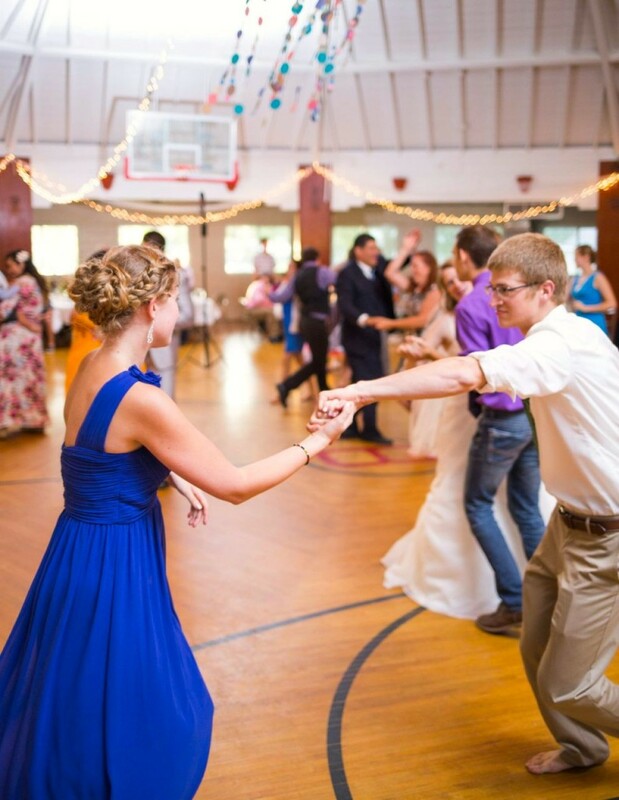 The wedding dance was a blast, with all ages having a great time out on the dance floor. 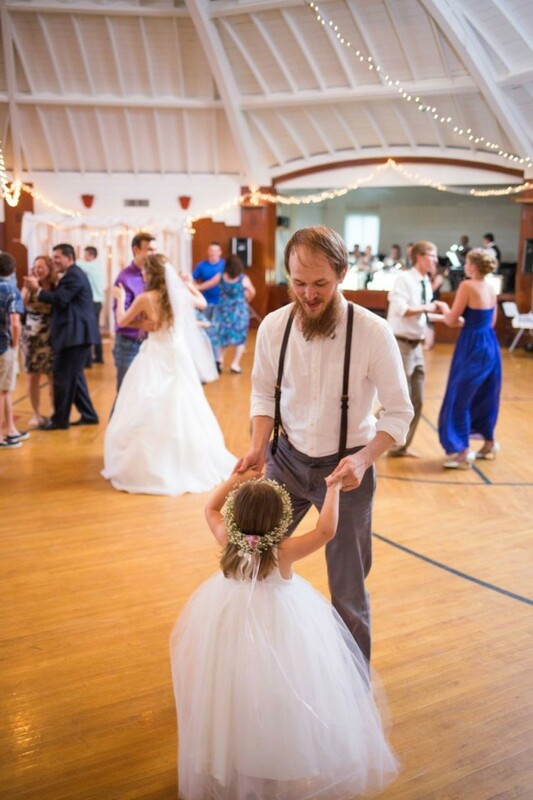 Here the flower girl dances with her Papa, Andrew. 6. Decide on YOUR style. Pinterest is a great tool. Pinterest is the enemy. Which way do you lean? Here’s what I’ve decided: in the planning stages, Pinterest is your friend. After everything is planned and half-done, Pinterest is your enemy. My advice: take the time to peruse Pinterest (today’s morque file: when I was an art student, my professors would encourage us to clip anything and everything–that is, physically use a scissors to cut out pictures from magazines–interesting to us, and to make an enormous file of these clipped pictures. Pictures of mice, plants, people, you name it–they all ended up in our files, that way if we needed to make a drawing of a mouse or a tulip or a kobucha squash, for example, we’d have a picture right there—at our fingertips. That was a hundred years ago!) and pin everything that you absolutely, positively LOVE. Your style will emerge. Is it glitzy and golden and lush looking, or rustic and homespun, or shabby chic-ish? Then work towards the look that you absolutely adore–that is, what your daughter absolutely adores. What makes her eyes light up, style-wise? Succulents + white twinkle lights in abundance + fresh flowers + sloppy puddling ribbons + punched paper circles = Bethie’s wedding style. 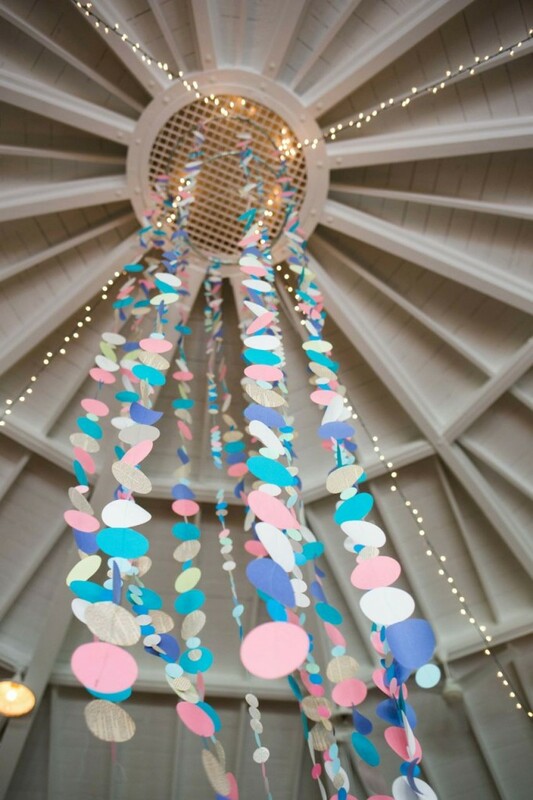 It was Amalia’s idea: to punch out circles out of colored papers and her stash of old-books-for-crafting, and sew the circles together to make garlands! We came up with these just a day or two before the wedding. We hung lots of them from the ceiling of the Bee Ballroom, an old roundhouse that is being restored in Bee, Nebraska. 7. Don’t pay attention to anybody else and their opinions. It’s hard–sooo hard–not to do this. Bethany and I are both people-pleasers to the extreme, so we were put into a tizzy again and again, as well-meaning friends offered their opinions on the way we chose to do things. Bryan–bless him--would come home to find us swimming in a puddle of tears, over something somebody had said–and he would pull us out, dry us off, and say “Do what YOU want to do. Don’t listen to anybody else.” Naturally there will be times where somebody will offer a suggestion that is helpful, but always test it to your original vision. If it doesn’t fit it, let it roll off your back, like water off a duck. It’s your daughter’s wedding. Nobody else’s opinion matters. Plus–I remember learning this lesson way back a hundred years ago, when I was planning my own wedding–there is just no way to please everybody, no matter how hard you may try to do that. It’s your wedding. Nobody else’s. Plan it according to YOUR vision of loveliness. 8. Start with what you already have. I can’t imagine how much more we would have spent on Bethie’s wedding if we hadn’t first looked around to see what we had available to use. 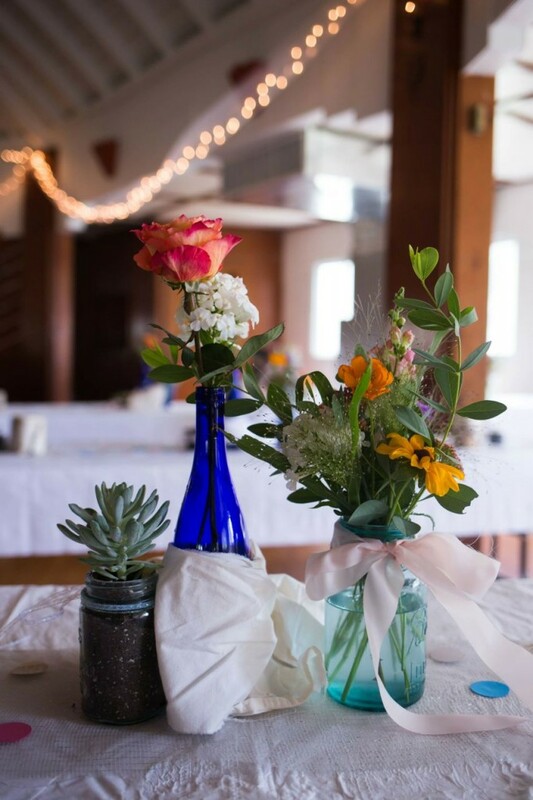 We borrowed things like vintage blue jars for the flower arrangements. We built the backdrop out of scavenged wood, and tore up paper and old cotton sheets that my sister gave us to make it. We used colored papers and fabric yardages for the paper garlands and the ribbons that we tied around the jars. 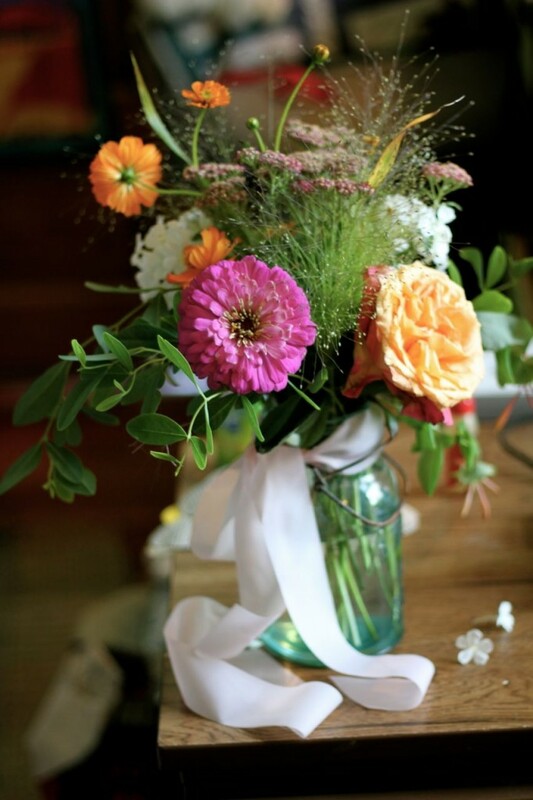 We borrowed a couple of boxes of these darling vintage canning jars for the flowers on the tables. I cut strips of inexpensive fabric that I bought to wrap around the jars and puddle on the tables, rather than buy expensive satin ribbons. 9. Join the Universal Sisterhood of the Mothers-of-the-Brides. Immediately. There is an extremely helpful, generous, and gracious sisterhood out there, that of the mothers-of-the-brides. Every mother that I knew who had recently planned and produced a wedding, came to me with her heart on her sleeve: “Tell me how I can help you. Let me give you this. Do you want me to look for something for you? Please tell me if I can do anything to help.” Honestly. It blew me away, it humbled me, and it made me determined to be just as helpful to other mothers-of-the-bride, when the time came. Here’s the thing: other mothers-of-the-bride get it. They know exactly what you are going through–the excitement, the tension, the confusion, the joy—and they want to help. Let them. From the beginning, write down everything–ideas, contacts, costs, etc. It’s such a big project and you will forget things if you don’t. Make lists and more lists. 11. Check out offerings in small towns. We are small-town folks, and we were operating on a relatively small budget, besides. So it made perfect sense to look in small towns for the things we wanted. We rented our venue, a historic building that is constantly doing fund-raisers for restoration costs. It is located in an out-of-the-way place (the tiny town of Bee, Nebraska!) but it was absolutely perfect. The folks who were in charge of it were very low-key and great to work with. They didn’t have so much going on that we couldn’t ever get ahold of them, for example. Basically the guy left the key for us under the mat. And it goes without saying that the small-town costs are going to be much less than the big city prices. 12. Tap into the Used Wedding Stuff market, before and after the big day. This was an eye-opener. Guess what? There are Facebook pages set up with the expressed purpose to enable you to buy and/or sell used wedding items. If you start early enough, you can buy nearly everything gently used (for one day!) or brand new, at used prices. I bought bolts of tulle, candles, votive holders, mason jars, and so much more from our local Facebook wedding page. After the wedding, I sold lots of it that way, too. Brilliant use of social media. 13. Be easy on yourself. Take breaks. Go to the movies. Get pedicures. Go on long walks and talk about something besides the wedding. As I was reminded over and over and over again: the important thing–the wedding of two individuals–will happen, whether or not you find just the right candles or tablecloths or musicians or whatnot. Don’t work so hard on the wedding that you can’t spend time together with your daughter and family, just savoring these days. Don’t forget that this day will only happen once (ideally!). Have fun and enjoy the process. It is a special, blessed time. Make some good memories of the whole planning process. I hope this post will help you towards that aim, so you won’t end up with a migraine the day afterward 🙁 or sad memories of exhaustion and regrets. Have fun! 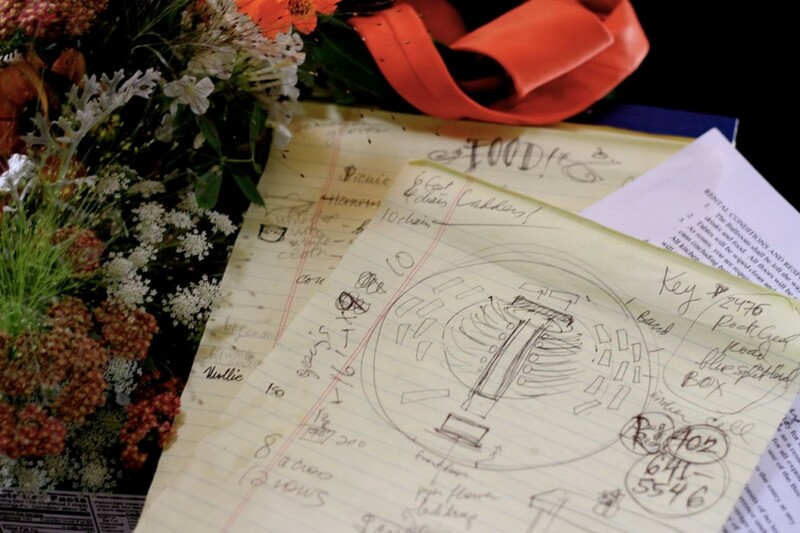 Design and plan and work and shop and create, but in the end–have fun with it! Thanks always for reading, Gentle Readers! Many of the photos in this post were taken by Ian Rothell Photography, and we recommend them highly. You can look at more of Bethie and Saia’s wedding photos in the link above. You can learn more about the Leo Lonnie Orchestra here. I can’t say enough nice things about them. Here is more information about the historic Bee States Ballroom in Bee, Nebraska. Thanks Nathana. Everybody’s experiences will be different, of course, but I was hoping this would be helpful to somebody! I love all of these! The pictures are beautiful. I definitely second the idea of networking with other “mothers of the brides”-when I got married a couple years ago, it was basically a community-run affair. For months, families in our homeschool group had been picking up extra bags of Chex Mix appetizers on their grocery trips, a woman in our neighborhood volunteered to spearhead all of our reception decorating, another woman in our neighborhood (whom we didn’t even know!) volunteered to polish our antique family serving spoons…the list goes on. There was even a random homeless man who swept and cleaned the steps of the church as I was getting ready in the Bride’s Room! Other people definitely love to help out where weddings are concerned! 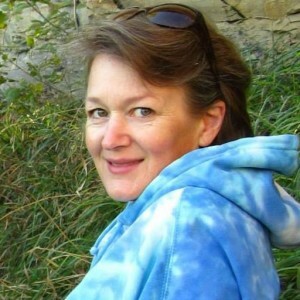 If I would have been a bit more organized, Anne Marie, I would have more help–I know lots of people offered help but I never got back to them. I just recently got married myself and I love all of your advice! Thank you Grady! It was very close to perfect, in fact. It was a lovely day, to be sure! I agree that you should begin wedding preparations early on. I think there is more to planning a wedding than most people realize. Depending on how elaborate the wedding, it may be a good idea to even prepare months in advance. I agree, Elden! At the risk of allowing it to take over your entire life, I’d say start planning as soon as you can before the big event! Very nice post to share. As we all know planing a wedding is such an hard and time taking work. Most of the bride and groom looses his/her mind while planing for wedding and its humiliating while executing this. The tips you’ve discussed here are quite meaningful and important for planning a glorious wedding without taking any tension.No. 3 and 4 are the best and most important according to me. 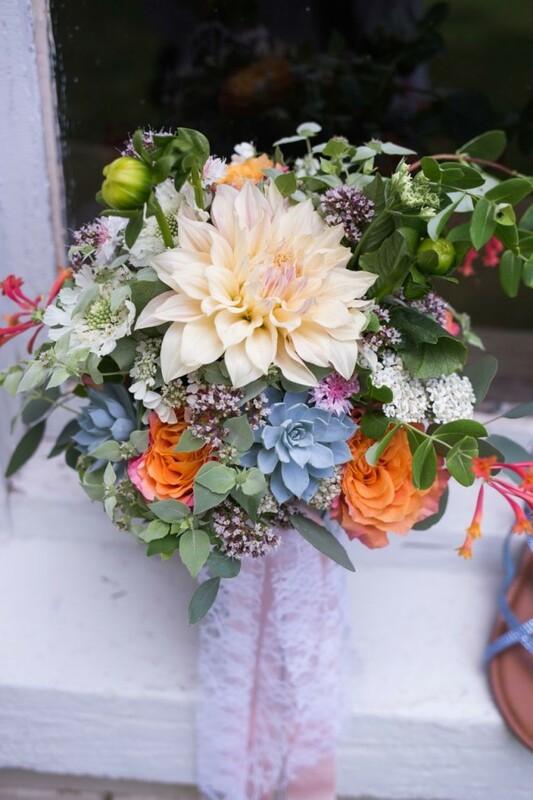 I had to go back and find this blog & re-read, now that I am a mother-of-the-bride! 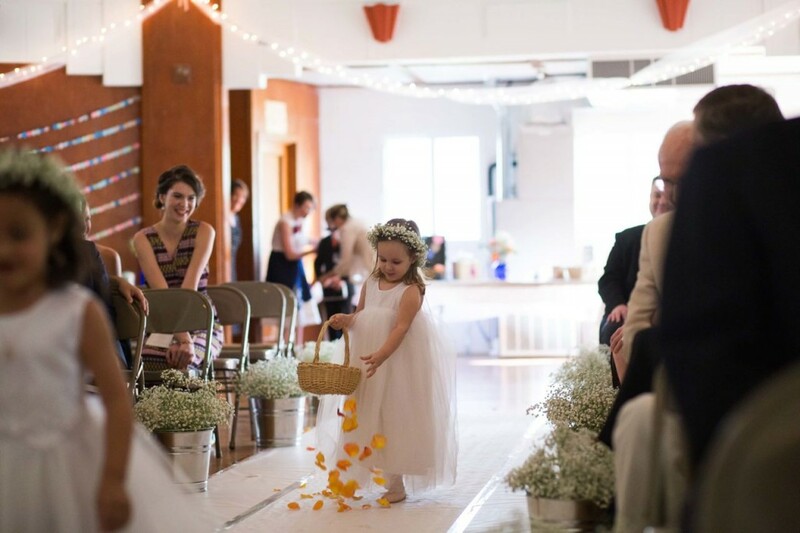 I will now go in search of the Facebook wedding page–I remembered you had mentioned this–and now I think it is time to start looking into it and utilizing (if there’s anything that fits daughter’s taste!). I’m going to send this to her, as I think it is worth-while reading! Wow, awesome tips! It is so sweet of you to keep in mind that it is all about your daughter and making her feel important on one of the most important days of her life! Thanks so much for sharing! Absolutely, Larissa–it’s all about the bride, after all! (And the groom, hehee). 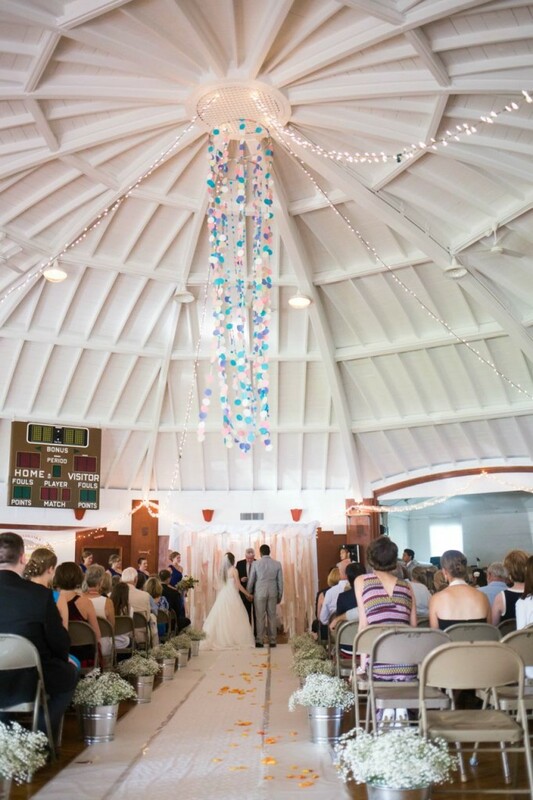 These are great saving tips for planning a tasteful, yet affordable wedding. There are so many options and alternatives to spending huge amounts of money on things you just can’t afford. Beautiful wedding! Thanks so much for sharing your advice with us! Congratulations on your mother of the bride status for the day. Bethany and Saia’s wedding looks lovely. lol! 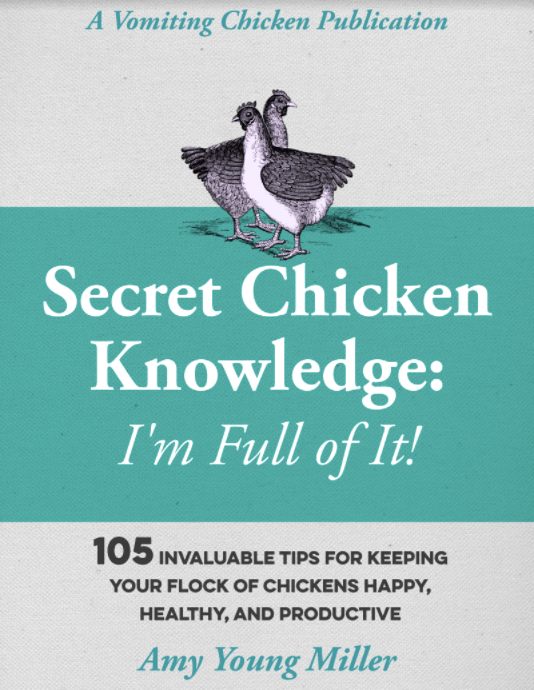 insightful and hilarious! Good read! I must say you are one such smart woman.That is totally right ”Romance doesn’t pay bills”.One should always decide the budget first before proceeding to wedding preparation.Everything is discussed so beautifully.